What Are Lens-Particle Glaucoma Symptoms and Signs? When Should One Seek Medical Care for Lens-Particle Glacoma? What Tests Are Used to Diagnose Lens-Particle Glaucoma? Can Lens-Particle Glaucoma Be Treated With Self-Care at Home? How Is Lens-Particle Glaucoma Treated? What Are Lens-Particle Glaucoma Medications? What Is Lens-Particle Glaucoma Surgery? What Is the Prognosis With Lens-Particle Glaucoma? Where Can One Find More Information About Glaucoma? Lens-particle glaucoma is a type of glaucoma that can develop following leakage of material from within the eye's lens. Lens-particle glaucoma may be caused by inflammation, trauma, or surgery. An ophthalmologist is a specialist who can diagnose and treat lens-particle glaucoma. Treatment of lens-particle glaucoma may include eyedrops to control eye pressure and inflammation. Glaucoma is progressive damage to the optic nerve, usually as a result of elevated eye pressure. The optic nerve receives visual information from the eye and transmits it to the brain. The pressure with the eye can rise if the fluid flow within the eye is interrupted. A clear fluid called aqueous is continuously being produced within the eye, providing nutrients and carrying away waste. This fluid flows around the lens and out through drainage channels called the 'trabecular meshwork.' 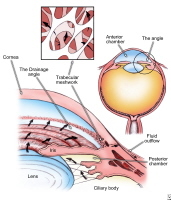 Lens-particle glaucoma occurs when bits of lens material are released into the aqueous (following surgery or trauma, as described below) and become trapped within the trabecular meshwork. The accumulation of this material in the meshwork results in blockage of the normal outflow of aqueous fluid. The eye pressure becomes elevated, putting the optic nerve at risk for glaucoma damage. The lens of the eye is made up of proteins and other material confined within an outer capsule. If the capsule is torn following a trauma, the material within the lens can escape into the aqueous fluid. Loose lens material can also be present following a cataract surgery. The lenses gradually become cloudy with age to cause cataracts. When a cataract is interfering with vision, an ophthalmologist can improve vision by surgically removing the cloudy lens and replacing it with a clear lens implant. In some instances, the surgeon may not be able to remove all of the lens material and small bits remain behind following surgery. Retained lens particles can also be released into the aqueous after YAG capsulotomy, a laser procedure often performed months after cataract surgery. Whether by trauma or surgery, when the lens particles are loose in the eye, two things can occur. First, the lens particles may clog the trabecular meshwork. Second, cells called macrophages enter the eye to clear out the lens debris and the cells themselves can clog the trabecular meshwork to cause glaucoma. If the combined lens particles and macrophages produce only a minor and temporary blockage of the trabecular meshwork, the eye pressure rise might be insignificant. However, if there is more extensive or prolonged blockage, eye pressures might rise to a level that puts the optic nerve at high risk from damage from glaucoma. Lens-particle glaucoma is distinct from other lens-induced or lens-related glaucomas such as pupillary block, phacomorphic glaucoma, and phacolytic glaucoma. If you experience the symptoms or signs listed above following eye trauma or surgery you should be evaluated by an ophthalmologist as soon as possible. Optic nerve damage from glaucoma can result in permanent, irreversible vision loss, so treatment should be initiated as early as possible. Regular follow-up eye examinations are also important, as glaucoma may be a late occurrence, developing weeks, months, and sometimes years later. Is my peripheral vision affected? Are medications or surgery necessary? An eye doctor will perform a complete exam, which will include measuring the eye pressure. Inflammatory cells can be seen in the aqueous with a slit lamp microscope. Larger fragments of lens particles are also visible with the microscope. A gonioscope is a periscope-like device with small mirrors that may be used to spot fragments hidden in the space near the peripheral iris (the 'angle'). 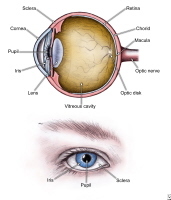 An indirect ophthalmoscope may be used to spot fragments in the back part of the eye (intravitreal fragments in the 'vitreous cavity'). Additional imaging devices such as ultrasound biomicroscopy and optical coherence tomography (OCT) can also be used to locate hidden fragments. The optic nerve is also carefully examined for signs of damage from glaucoma. Optic nerve thickness measurements and visual field testing may also be necessary to determine the extent of nerve damage. Complying with your eye doctor's instructions is very important. Keep in mind that uncontrolled glaucoma can result in permanent vision loss. Additionally, taking measures to keep the optic nerves healthy will help them withstand elevated pressures to some degree. These measures include stopping smoking, keeping blood pressure under control, and maintaining healthy blood sugar levels. Often, the lens fragments will dissolve or break down into smaller particles that are then naturally cleared from the eye with the aid of the body's immune cells. While awaiting this clearance, the eye pressure must be monitored and managed very carefully. If the eye pressure rises, the first line of treatment is typically a combination of pressure-lowering eyedrops and anti-inflammatory eyedrops. Frequent follow-up is essential to monitor the pressure because it may fluctuate during the first days/weeks. There are pressure-lowering eyedrops that decrease the inflow of aqueous and some that help improve the outflow of aqueous. Your doctor will determine which drops are likely to work best depending on your ocular and medical history. Rarely, oral or intravenous medications are required to treat very high eye pressures. Anti-inflammatory eyedrops include nonsteroidal anti-inflammatory drops and steroid drops. Additionally, a dilating drop may be used temporarily to reduce long-term complications of inflammation. The goal of therapy is management of the eye pressure. Medications often only are used for a short period of time while waiting for the lens particles to clear, after which they can be discontinued. The eye pressure will still be monitored after medications are stopped. Sometimes, pressure rises again and therapy must be resumed. Sometimes the lens fragments and particles are simply too large or numerous and eye pressure remains uncontrolled despite treatment with medicated eyedrops. Surgery may then be required to remove residual lens particles. Depending on the degree of elevated eye pressure and inflammation, daily to weekly follow-up care may be necessary initially. Most of the follow-up care is on an outpatient basis. Hospital admission is rarely necessary, but may be considered if the eye pressure requires intravenous medication. Once the lens particles clear and the eye pressure returns to its baseline, the extent of optic nerve damage from glaucoma is assessed. Then plans for long-term follow up will be made. With appropriately timed medical and surgical intervention for lens-particle glaucoma, prognosis is generally good and complications are minimized. However, in those who already have optic nerve damage from other types of glaucoma, such as 'open angle glaucoma,' the prognosis may not be as favorable. For this reason, regular eye examinations with an ophthalmologist are essential. Support groups and counseling for people who are living with glaucoma, as well as informational material about lens-particle glaucoma, are available through various organizations specializing in eye care. Epstein, D. L. "Diagnosis and management of lens-induced glaucoma." Ophthalmology 89.3 (1982): 227-330. Kee, C. and S. Lee. "Lens particle glaucoma occurring 15 years after cataract surgery." Korean Journal of Ophthalmology 15.2 (2001): 137-139. What symptoms did you have with lens-particle glaucoma? What caused your lens-particle glaucoma? What medications have you taken for lens-particle glaucoma? How did you care for your eyes following lens-particle glaucoma surgery?